If you’re a curious person like me, you live for a good whodunit. You’re someone who actually times themself while watching an episode of Monk/Bones/Elementary for how long it takes for you to solve the case (personal record: 8 minutes in). You might even be the type who when reading a mystery novel skips ahead to the back to confirm your deductions, too impatient to actually read through all the way to the conclusion. But, if you are in that minority of humans who enter into otherwise normal conversations with an unnatural suspicion about hidden motivations then it might be time to channel all that into a really good detective story. Besides the usual advice for writing genre fiction – for example to voraciously read/watch as much as you can from the genre you’re trying to write – I have some suggestions for how to construct a case. I always start with the crime. Being who I am (read paragraph one if you’ve forgotten) I think about crime a lot, but picking through all the options for a new story is a special time in my process. It’s like being given exclusive access to the Apple Store on Boxing Day – the options are endless. It’s a powerful feeling. I’ve written about jewel theft, kidnapping, arson, bank robbery and lots of murders – from poisonings to stabbings to shootings and I’m not done yet. So pick your crime. Now get to know your crime, read as much as you can about crimes like it, make notes, watch news coverage of them, make more notes. In the case of my arson story I did a whole bunch of research on accelerants and then took that notebook to a chemist friend and talked it through with him to make sure my findings were in fact accurate. I then spoke to a history professor about the availability of the chemicals in the time period I set for the story. I took more notes, crossed out entire pages of research, and started again when I discovered one of the chemicals wouldn’t be readily available at the time my detective is detecting. From this sub-divided list I find it easy to lay out the players. Who is the victim? Who are the by-standers who may also become suspects? Who are the ‘others’ in the room who influence the case? You may think that this is the point where the perpetrator becomes obvious, but that’s not true! You’re jumping ahead to the last chapter! Stop that! That’s the question I find myself circling with that list of clues and players in front of me while wearing my Batman cape and cowl. Ok, maybe not the cowl because it doesn’t fit well over my glasses. Think about who would benefit from the crime. What would their motivation be? Is it believable? Would someone really kill someone over a game of chess? Really? Yes they would it turns out – look up murder chess-related on Wikipedia. No seriously. Back to the case: is that a motivation I can hint towards through scenes in the book and investigation by my detective? What kind of clues can I lay down to lead to the discovery of this motivation? I now extend this process to my by-standers-who-will-become suspects. It’s from this web of suspects and their motivations for committing the crime that I pick my perpetrator. With the perpetrator in hand and the rest of the suspects spread out around them, I build my timeline of events. When did the crime occur? When did my detective get brought in on it? When did each of the suspects interact with the victim enough to become suspects? Using this timeline approach I’m able to identify the scenes I need for my detective to solve the crime. Now I’m not saying that this approach is for everyone or even that it works for me every time for every crime (look, I’m a poet too!). Think of this as a chalk outline at a murder scene my friends, it’s just the outline. You still have to fill in all the details in a convincing way that keeps pulling the reader along clue by clue and scene by scene. What are your tricks for writing detective fiction? Leave a comment to let everyone know! Check out this cool video that gives even more insight into writing detective fiction. It can be found on the Youtube channel One Fictitious Moment. Angela Misri is a Toronto journalist, writer and mom who has spent most of her working life making CBC Radio extraterrestrial through podcasts, live streams and websites. 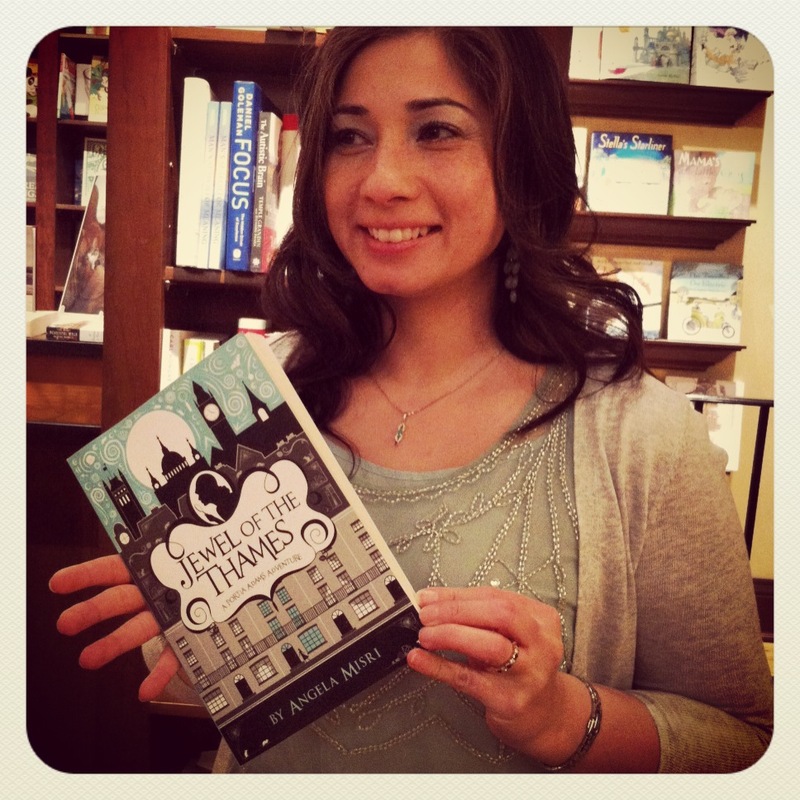 Her first book Jewel of the Thames, was published by Fierce Ink Press in March 2014 and is the first in a series called A Portia Adams Adventure. When I created my Rafferty & Llewellyn police procedural series, I started with the main characters who would proceed through each novel. I’m a firm believer that it’s CHARACTER rather than plot, that grabs the reader’s attention and keeps it. As I feel middle-class cops are over-represented in UK mysteries, I wanted to depict one of the’ Ordinary Joes’, who are actually the majority in the police service. I also wanted to create a series that had some humour rather than a sternly Sherlockian viewpoint. To this end, I created my DI as a working-class, lapsed Catholic, with an Irish background, from a family whose observance of the law wasn’t one hundred per cent, and whose Ma had a certain fondness for suspect ‘bargains’. And when I paired him with the more-moral-than-the-Pope intellectual, Dafyd Llewellyn, even more fun ensued! Fifteen books in the series later, I’m still not jaded and my mind still enjoys turning over possibilities to drop Rafferty in ever more deeper mire! I started with the idea that Rafferty’s family as depicted in the sub-plot was every bit as important as the murder mystery aspect. Yes, I enjoy that as well and have done my share of poisonings, stabbings, bludgeonings, etc. Unsurprisingly, the theme ‘family’ and the difficulties they can cause, features frequently. 1. I need to look up your book series because what you describe above is exactly what I love to read. 2. I couldn’t agree more that character is so central to the story… it’s why I almost use the cases Portia is on as sub-plot, with her character development playing the major role of plot. Love it, Angela. Another potential fan! Certainly, as a reader, if I have no interest in or sympathy with the characters, I’m less likely to stick with the book, no matter how big its portrayal as a blockbuster. Here’s a situation that arises continually in the Lew Archer novels: someone Archer is investigating is surprised to learn how much he knows about them. In Black Money Kitty Hendricks voices this surprise in virtually those very words –“How do you know so much about me?” Usually, though, the knowledge Archer has obtained when this question comes up turns out to be peripheral – that is, it doesn’t bear directly on the solution to the case but is just a part of the hopelessly tangled morass of action and information Archer is working his way through. In the novels that most critics and scholars seem to feel comprise the mature Macdonald style – The Galton Case through The Blue Hammer – the reader is constantly being thrown off the scent this way. I’m writing my third cozy mystery and it’s important to remember to “play fair” with the reader. The killer can’t be a minor character who only appears on page 179. The clues must logically point to the villain and no “acts of God” or illogical twists of logic to reveal the criminal. Also put in plenty of red herrings to keep the reader off balance! And what I hate the most is when the hero stumbles around, doing no deduction at all, until the bad guy kidnaps him at gunpoint and pours out a long confession on who and why he dunnit. Really? The bad guy would simply kill the hero and escape, not wait around for the cops to arrive. You made me laugh with your last comment — a touch of the James Bond’s! The baddie always seems to do that, with some long, convoluted method of killing our hero. Yes, the mystery author must always play fair with the reader; that’s a must. I find it strange that some authors don’t seem to grasp that aspect of the genre. I agree with Sally, and its something I have complained about as a reader so I hope I’m never accused of it as a writer! Really interesting post. I write locked room/impossible crime fiction, so always start with HOW the crime was committed rather than the who or why. It’s incredibly rewarding to offer the reader everything they need to know within the first few pages, then try and provide a fulfilling ending without them working it out. Particularly like the part about picking out clues – I always find constructing a convincing “aha!” moment really challenging. That is so interesting P.J. – I’ve only written one locked room story (it was a short-story) and I really struggled with it.. I wonder if its because I should have tried approaching it the way you describe – with the HOW instead of the WHO. I’m going to read your linked story now – thanks! My article for Kobo Writing Life. Fun to write, fun to read! I have begun a series of short detective fiction called “Noir de Jure,” starring a retired New York detective transplanted to Tampa. The first story “Ybor Noir” was originally written as an entry into a short fiction contest (3000) words or less, and it was a finalist for both “Reader’s Choice” and “Editor’s Choice” awards. I had so much fun writing it that I decided to make it an ongoing series. It was surprisingly difficult to write a decent story that was so short. It’s available as a free download everywhere, and I would much appreciate reviews and advice from the community, specifically regarding the “realism” of the dialog. I absolutely love writing short stories and fiction! Thanks for the information! This prompted me to peruse about half of The Drowning Pool – 133 pages or so – to see how many similes I could count. (I’m using the Vintage Crime Black Lizard edition from May 1996). I counted thirty four and no doubt missed a few. (REVISION 11/30/14: The number is much higher. Going back over the work a second and third time I see I missed a lot in my initial sweep.) I haven’t done the legwork, but I think some of the later books might have a slightly higher ratio. That’s a lot, but in any case I would argue that many of Macdonald’s similes are so strong that they infinitely enrich the work. Not only that – they are so strong that they put many “serious” writers of fiction to shame. This is a really interesting thing to know if you like detective or cop stories. I like that you pointed out what the characters need to know. It seems if you do that you could create a better story. Do you know of any really well write detective or cop books to use as a reference?